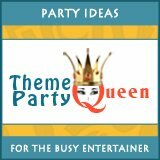 Below you will find links to theme party articles written and published by Sandee Lembke and by other contributing authors. Find some easy party recipes and articles on how to host some of the most popular theme parties including Bunco and Fondue. Also, learn some great tips on making inexpensive wall art and centerpieces. All of these articles can be reprinted as long as the author's resource box at the end of each article, including links to their blog or website, stays intact. This ensures the author is given credit for their work.